The friendly atmosphere and general lack of restrictions on what spectators can take into the venues at Sochi make a refreshing contrast to the usual experience at sporting events in Russia. At first glance, the sight of a sports fan sitting in an arena swigging from a bottle of cola or sipping a cup of tea probably wouldn’t raise an eyebrow. But in Russia, surprisingly, this is big news – and the opportunity to grab a beer or a (plastic) glass of wine while watching the Sochi Olympics is a dazzling leap forward in the sporting experience here. In a land where big games often prompt widespread crackdowns on alcohol sales, and stadium security requirements frown on any refreshments within sight of the playing area, chewing and cheering have rarely gone hand in hand. So what’s different about Sochi? Well, first of all, inevitably, it’s about money. Certain companies have paid huge sums to have the exclusive rights to peddle their sugary wares in the Olympic Parks. To maximize the return on that investment, of course, sales opportunities also need to be super-sized. Suddenly the old rules no longer apply, and fans are welcome to take food and drink to their seats. Secondly, the crowd in Sochi isn’t quite the same crew that turns up to Russian Premier League football matches. There’s far more of a family vibe, and less of the toxic fanaticism that infects domestic sports. By and large, spectators are here to support their favorites, not denigrate the opposition. Rival flags hang side by side in the arenas and many events attract a heavy spread of neutrals looking to take part in the Olympic experience regardless of what’s on offer. Admittedly it’s not a free-for-all: while the smaller hockey venue - the Shayba Arena - has a relaxed policy, and serves alcohol in the arena bars, the larger Bolshoi Ice Dome – venue for all of Russia’s games – has tighter security and is an alcohol-free zone. Passions run high at these events, and with the cameras of the world trained on clashes like Russia vs the U.S., the organizers are taking no chances. At the same time, treating spectators with respect also makes a big difference. That uncomfortable sense that the waiting police contingent at [Moscow’s] Luzhniki Stadium is almost as big as the attendance for the game has been banished. Much of the ticket checking and security work is done by volunteers, making for a far less intimidating experience. The overall atmosphere is friendly; the much-touted “ring of steel” does mean airport-like security at the entrance to the park, but once inside, progress is hindered by nothing more than a ticket check at the event venue. 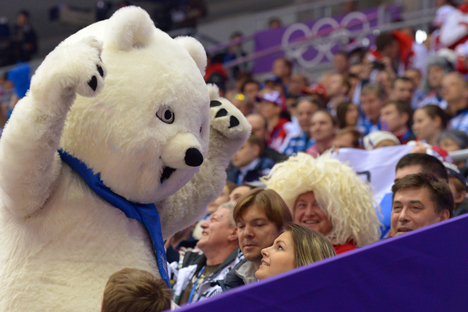 It’s a stark contrast with the KHL spectator experience – fans at most Russian hockey games tend to be herded through surly police checks and strictly told that food and drink is not permitted in the arena itself. In Moscow, at least, booze is prohibited anywhere in the venue, and generally any snacks and refreshments must be consumed in the concourse, out of sight of the playing area. This is something that has attracted comment in the past – various players in the KHL have spoken sympathetically about the problems that fans face, while generally insisting that it would be risky to change until it becomes clear that unruly supporters won’t abuse that trust. Maybe the evidence that players sought in the summer can be gathered here at Sochi’s Shayba Arena, and next season supporters can look forward to raising a beer to their heroes on the ice.